Copyright © 1997 by Academic Press. All rights of reproduction in any form reserved. tration of the hormone can be of concern when extra amounts are needed and may not be anticipated when acute traumatic stress occurs. Glucocorticoids can induce proteins or repress the expression of certain proteins by transcriptional actions. A general result of glucocorticoid action is the direct effects of increased glycogen, especially in the liver, and increased level of circulating glucose. The latter effect may occur through direct stimulation of certain rate-limiting enzymes in the gluconeogenesis pathway and through the negative effects of the hormone on peripheral cells, which cause them to cease taking up nutrients (glucose) from the blood. Prolonged high levels of glucocorticoids can lead to the death of susceptible cells, which accounts for muscle waste and immunodeficiency. However, early effects of glucocorticoids probably do not include immunodeficiency and /3-endorphin, which is secreted from the pituitary together with ACTH in the stress response, but may actually stimulate the action of certain immune cells. Glucocorticoids are known to exert permissive effects on cells, without which many other hormones could not induce particular cellular proteins. The permissive action of glucocorticoids may require mediation through the transcriptional level. Some permissive actions of glucocorticoids are related to their ability to induce cyclic AMP-dependent protein kinase or to transcriptionally interact with this pathway. As powerful anti-inflammatory agents, glucocorticoids act on many cells through the normal receptor mechanism to induce a protein(s) known as lipocortin or one of the annexins. Lipocortin is an inhibitor of phospholi-pase A2 and thus prevents the release of arachidonic acid (and other fatty acids) from phospholipids in the cell membrane. These fatty acids are precursors of prostaglandins, prostacyclin, thromboxanes, leuko-trienes, and lipoxins, some of which mediate processes of inflammation and pain. Their production is depressed by the glucocorticoid-induced lipocortin, whose action may represent one pathway by which glucocorticoids exert their anti-inflammatory effects. Another effect on reducing inflammation involves the glucocorticoid suppression of the inducible cyclooxy-genase, an enzyme involved in the production of inflammatory prostaglandins and prostaglandin relatives. Glucocorticoids have been shown to stimulate the uptake of Na+ into tubular epithelial cells of the large intestine and kidney by a process (presumably involving the Na+-H+ antiporter) that is discrete from that regulated by mineralocorticoids (Na+ conductance channel), so that Na+ uptake into tissues appears to be a specific response to glucocorticoids as well as to mineralocorticoids. Water balance would also be affected by this activity. All of these effects, i.e., cell-specific metabolic changes, specific cell death in certain cases, permissive effects in a wide variety of cell types, profound antiinflammatory effects exerted through the induction of lipocortin (armexin I), suppression of cyclooxygenase, and effects upon Na+ retention, contribute to the systemic effects of this hormone. In addition, some actions of glucocorticoids occur so rapidly that one must consider a nontranscriptional route of signal transduction. A case in point is the rapid action of glucocorticoids in the treatment of acute asthmatic attack, a palliation that can sometimes occur in minutes in the airway. 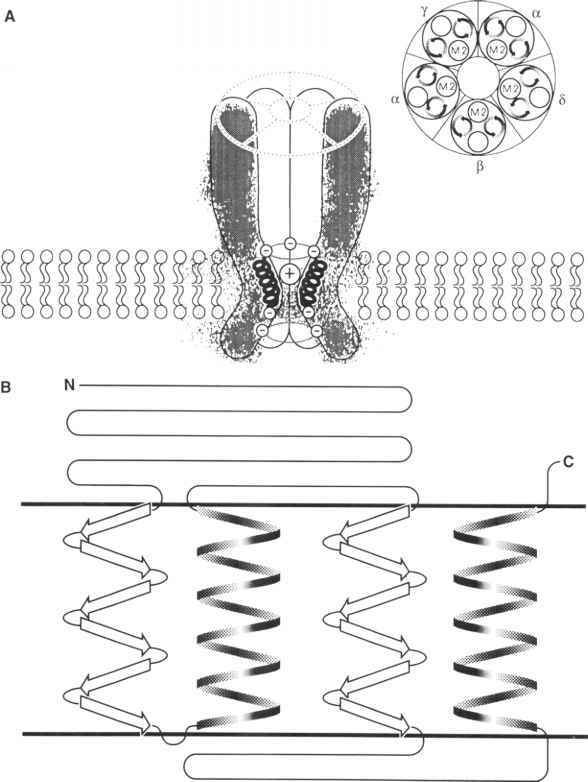 In this connection, it has been established that some nerve endings contain a nonclassical membrane glucocorticoid receptor that may mediate ion transport or some related activity by a nontranscriptional signaling mechanism. Mineralocorticoids promote sodium and potassium transport, usually followed by changes in water balance. This function is essential to life, but in some cells can be produced by glucocorticoids. Glucocorticoids and mineralocorticoids generally act through their own specific receptors, but in certain situations they can bind to the same hormone receptor. Thus, each can be expected to exert effects typical of the other, especially when large amounts are administered. In fact, both hormones seem to be involved in Na+ ion uptake in tubular epithelial cells. Mineralocorticoids act on the kidney to maintain water balance through the control of sodium ion uptake and mesh in function with the vasopressin system through the control of water reabsorption. Potassium ion transport is also affected by mineralocorticoids. Because of the overlapping specificities of mineralocorticoids and glucocorticoids, much of the molecular interactions of these two hormones remains to be sorted out. A critical feature of aldosterone is that it is secreted in effective amounts only during stress. In certain cells such as mononuclear cells, there appears to be a small number of membrane-associated aldosterone receptors, which would mediate direct effects on ion transport. An important aspect of the crossover effect of glucocorticoids acting on the mineralocorticoid receptor, especially in the kidney, is the ability or inability to inactivate Cortisol as a potential ligand for the mineralocorticoid receptor through the 11/3-hydroxysteroid reductase enzyme. This enzyme catalyzes the removal of a proton from the 11/6-hydroxy group of Cortisol to render it ineffective as a ligand for the mineralocorticoid receptor in the kidney and thus inactivates its potential for increasing Na+ reabsorption and hypertension. There are some known genetic defects in this enzyme that could be the cause of hypertension. Dehydroepiandrosterone circulates at very high levels in the bloodstream, mainly as the sulfate derivative. A receptor for this hormone had not been discovered for a long time but now may have been found. It is probably the main source for androgens (via testosterone) in females and can be converted to estrogen as well by the aromatase enzyme system. It is apparently important in fetal development in supplying cells with a precursor for estrogen synthesis. The adrenal glands are small organs embedded in fat and enclosed by coverings located above the kidneys. For this reason, they are often referred to as the suprarenal glands. The glands on each side of the body have different shapes; the right one is shaped like a pyramid, whereas the left one is crescent shaped. Nevertheless, they are easily recognized even in small experimental animals. In men, the glands weigh about 5 g each, and their general locations are indicated in Figure 10-1. 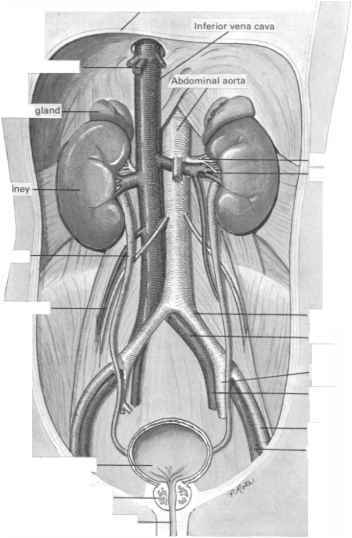 These glands are well supplied with blood vessels, including a branch from the aorta and a branch from the renal artery (Figure 10-2). The blood entering the adrenal cortex is drained out through the adrenal medulla. This is significant in view of the regulation of an important enzyme of the medulla by Cortisol from the adrenal cortex. The adrenal blood supply empties into a major single central vein, which merges with the renal vein (Figure 10-2). The adrenal gland consists of two major parts, an outer cortex and a central medulla. The cortex is the part responsible for the formation of the steroid hormones, aldosterone, Cortisol (hydrocortisone), and dehydroepiandrosterone (DHEA), as well as amounts of analogous hormones that are metabolites in the pathways of syntheses of these hormones. The adrenal medulla is made up of modified nervous cells and secretes the catecholamines, principally epinephrine (and norepinephrine) (see Chapter 11). The cortex is involved in short- and long-term stress reactions, whereas the medulla takes part in sudden or alarm reactions and is under nervous system control. Catecholamines and enkephalins are released from the medulla instantaneously following a signal transmitted by the nervous system. This signal probably originates in the hypothalamus and arrives in the medulla by way of splanchnic nerves from the spinal cord. As expected from their greatly differing functions, the cortex and the medulla arise from different precursor tissues during development. The adrenal cortex is mesodermal in origin, formed by ingrowth of the peritoneum. The medulla arises from the neural crest and is ectodermal in origin. Essentially, the medulla may be thought of as specialized nervous tissue designed for secretion. By the fifth week of development a suprarenal groove appears above and on each side of the dorsal mesentary (Figure 10-3A). The cells lining the groove (mesothelial cells) begin to proliferate (Figure 10-3B), and a "primary cortex" is derived from this proliferation (Figure 10-3C) by the seventh week of development. While this process has been going on, neural crest cells have moved downward toward the cortex. By 7 weeks the mesothelial layer becomes active again (Figure 10-3C) and produces a new group of cells that are laid down upon the cells of the primary cortex and become the "secondary cortex" (Figure 103D). Eventually this will be covered by a connective tissue capsule. In the meantime, the cells of the sympathetic ganglia (neural crest cells) have invaded the primary cortex to form the forerunner of the medulla (Figures 10-3E,F). In fetal life the human adrenal is large. At term and for the first postnatal year or longer, the primary cortex begins to atrophy while the cells of the secondary cortex actively divide. The primary cortex is often referred to as the "fetal cortex" because of its transient life. It functions like the testis and is uncharacteristic of the mature adrenal (see Chapter 14). As the fetal cortex disappears, the zona glomerulosa appears immediately adjacent to the capsule. It is present at the termination of pregnancy. With continued proliferation, the next inward zone, the zona fasciculata, arises and within a few months after birth the most inward layer of cells, the zona reticularis, is formed. FIGURE 10-1 Summary of the major anatomical components of the urine-forming system. Reproduced with permission from Chaffee, E. E., and Lytle, I. M. (1980). "Basic Physiology and Anatomy," 4th ed., p. 483. Lippincott, Philadelphia. PA.
androgen dehydroepiandrosterone (DHEA) in rather large quantities (15-25 mg/day). In addition to DHEA, a small amount of testosterone is formed in the reticularis layer. The fine structure of the cells of the zona glomeru-losa contains relatively long mitochondria with lamellar cristae, and these differ from the mitochondria in the cells of the other adrenal cortical layers. The zona fasciculata is the largest of the three zones and is made up of columnar cells that are polygonal and form cords that radiate from the zone above. The mitochondria of these cells vary in size, but are usually larger than the mitochondria in cells of the other zones. The zona reticularis contains networks of interconnecting cells. Mitochondria in these cells resemble those in the cells of the zona fasciculata. FIGURE 10-2 (A) Arterial blood supply and venous drainage of the adrenal gland in the dog. (B) Blood supply of the adrenal cortex and medulla in the dog. Reproduced from Coupland, R. E. (1975). "Handbook of Physiology" (R. O. Greep and E. B. Astwood, eds. ), Section 7, Vol. VI, pp. 282-294. American Physiological Society, Washington, D.C.
upper center. 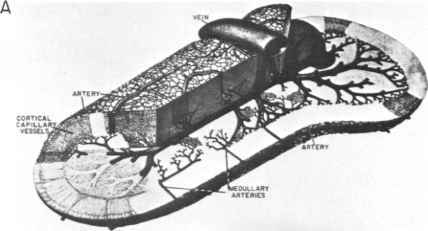 From this drawing it is clear how the circulation efficiently bathes the hepatocytes. Also clear from this figure is the fact that the large majority of cells in the liver are hepatocytes, with bile duct cells and Kupffer (scavenging) cells being in the minority. At least 65% of the liver cells are probably hepatocytes. Another major target of glucocorticoid hormones is the thymus. It is located above the upper end of the heart. The thymus has a relatively large size in newborns and is invested with immunological functions. Its size decreases with age until adult proportions are attained largely due to the death of thymus cortex glucocorticoid-sensitive cells as the adrenal zona fasci-culata becomes more active in secreting Cortisol. The thymus cells killed off by apoptosis in this way during development probably contain large numbers of glucocorticoid receptors per cell. The histology of the thymus is shown in Chapter 17. Besides a capsule, there are two main layers of cells: the cortex and the medulla. Thymocytes are similar to the lymphocytes of other lymphoid organs and in circulation. There are many free ribosomes and a large nucleus containing chromatin condensed in large masses in close proximity to the inside nuclear envelope.